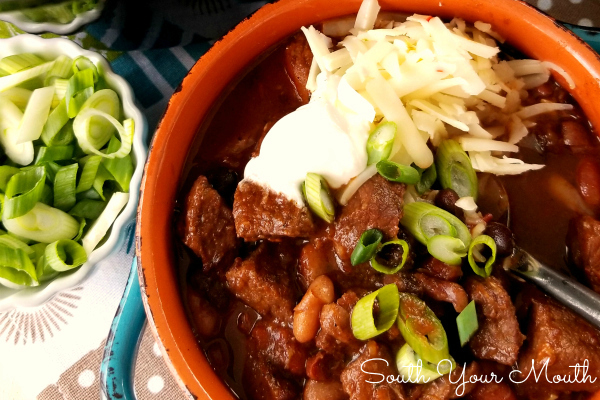 A crock pot chili recipe with tender steak, smoky chipotle peppers, Mexican spices and the perfect blend of beans. This recipe has been on my bucket list for years! You may remember I set out to make it once before but my beans went missing (dang kids!) and I made the Beef & Lentil Stew instead (which was blow-your-mind delicious so it all worked out). I am utterly obsessed with making chili recipes but had never ventured into making it with steak. 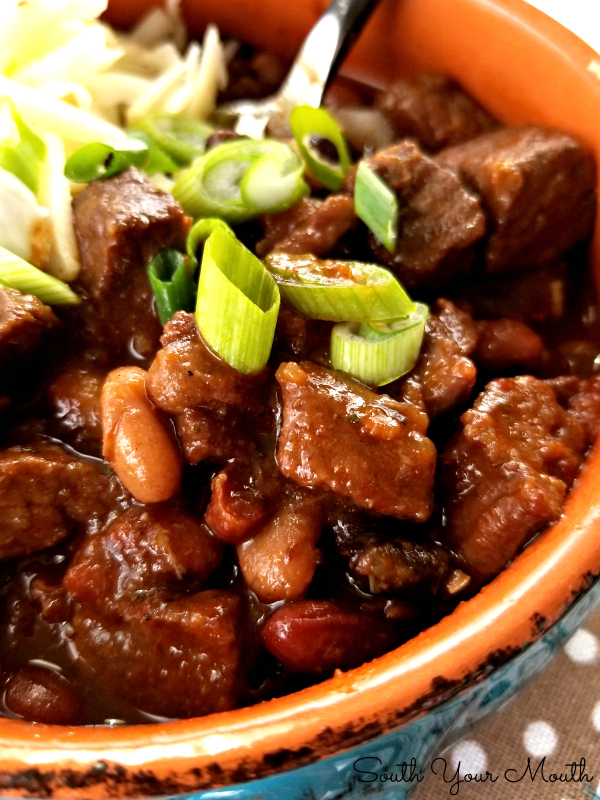 I had a grilled ribeye at a restaurant once that had been marinated in smoked chipotles and adobo sauce that made a SERIOUS impression on me so I had that kicking around in my brain when I set out to craft a recipe for this chili. 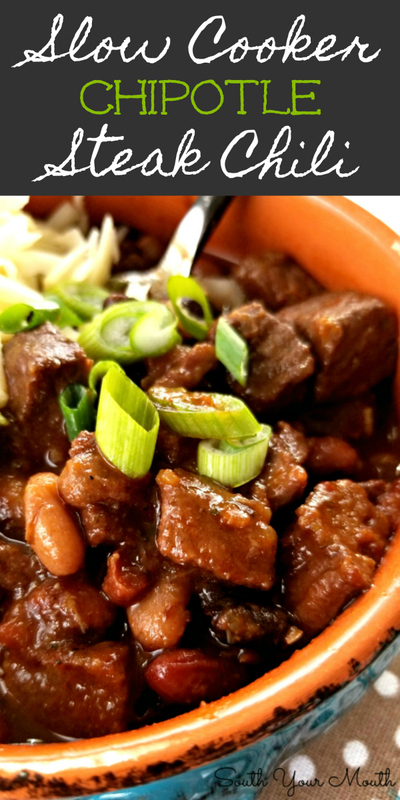 And I knew I wanted to use the slow cooker chili beans from Hurst’s because they have the perfect blend of beans and seasoning. I wanted to use dried beans because I knew letting the steak slow-cook with the beans would made for bites of steak that were as tender as butter! Now, I have to tell you what happened to this batch of chili once I was done cooking it. We were headed to visit some friends so I decided to bring the chili for everyone to try. Loving food like I do (and maybe because I love that everyone expects something good from my kitchen) I prepared dishes of chopped scallions, shredded cheese and sour cream in pretty, coordinating bowls to bring with me. I made a big skillet of cornbread and brought a basket of Fritos (lined, of course, with a decorative towel that matched the pretty bowls). I loaded everything on a great big baking pan and set it in the back of my car. I secured the lid of the crock pot down tight then wedged it in the car next to the other supplies. Husband jumped in behind the wheel and off we went. On the way there I said, “I SMELL THE CHILI!” As he’s taking a curve on two wheels I hollered at him to drive careful or there’s going to be chili slung from here to Kingdom come! You know how well husbands react to their wives telling them how to drive right? Well… during the drive the lid came loose on the crock pot so when we got to our friends’ house it looked like a Taco Bell exploded in the back of my car. 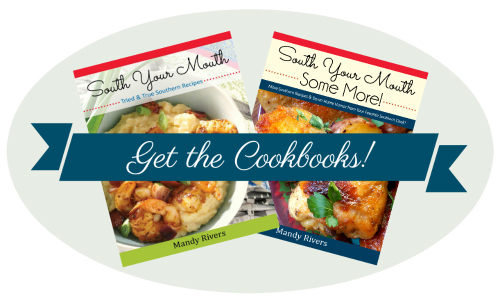 There was chili sloshed all over the little bowls of toppings, soaking into the cornbread and in every nook and cranny of the basket of Fritos. Husband told me that’s what I get for being Ms. Fancy Pants. I told him that’s what I get for letting Mario Andretti drive. 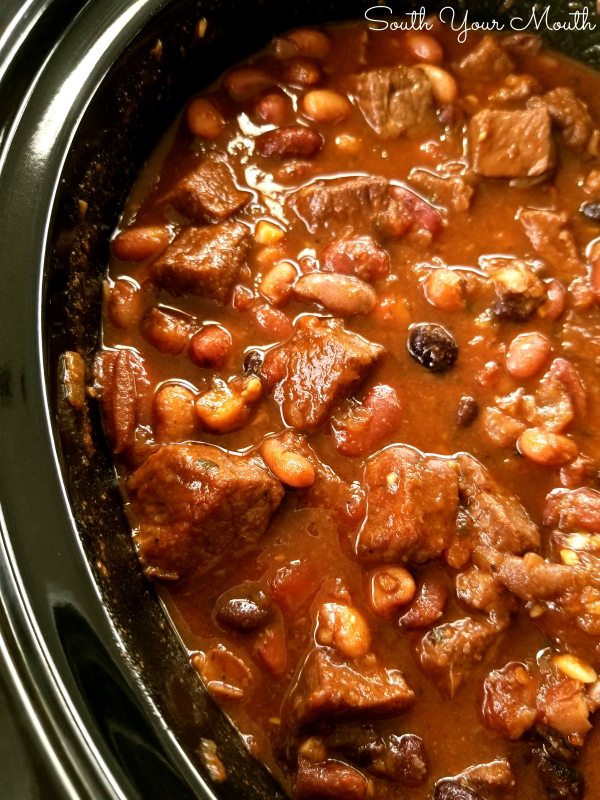 Add beans WITHOUT seasoning packet (set aside to add later) and beef broth to a large slow cooker. Cook on high for 4 hours (see notes below about alternative cooking method). Cut steak into bite-sized pieces, season liberally with salt and pepper then sear in a large skillet coated with oil. Cook the steak in 2-3 batches – don’t overcrowd the pan. Don’t cook the steak all the way through, just get a nice sear on the pieces. Place steak and all pan juices into the slow cooker. To the same skillet, add a little more oil then sauté onion for 4 minutes. Add garlic and continue cooking for 2 minutes. Add contents of the skillet to the slow cooker. Remove 2 chipotle peppers from adobo sauce then dice (see notes about spiciness!). Add diced chipotles, 2 tablespoons of adobo sauce and remaining ingredients (including reserved seasoning packet) to slow cooker. Reduce heat to low then continue cooking for 2-3 hours or until beans are tender. Let chili rest, uncovered, for 30 minutes before serving (this will thicken the chili). If you need to leave for the day and can’t wait the four hours for the beans and broth to precook, this recipe can be cooked all together. Once you sear the steak and sauté the onion and garlic, add everything to the crock pot then cook on low for 8 hours. Chipotle peppers in adobo sauce are pretty spicy! I made the recipe exactly as I have it written above and, while it certainly had some heat to it, it wasn’t too spicy for the crowd I fed it to (which included half a dozen kids). If you don’t want yours spicy, remove the seeds from the peppers before dicing (they’re very soft but they slit open just like a fresh pepper – just use the back of a knife to slide the seeds out of the pepper once you cut it open). If you want things MORE spicy, use more than two peppers (each can has about 5-6) and use every last drop of that yummy adobo sauce. Chipotle peppers in adobo sauce are located in the Hispanic food section of your grocery store. 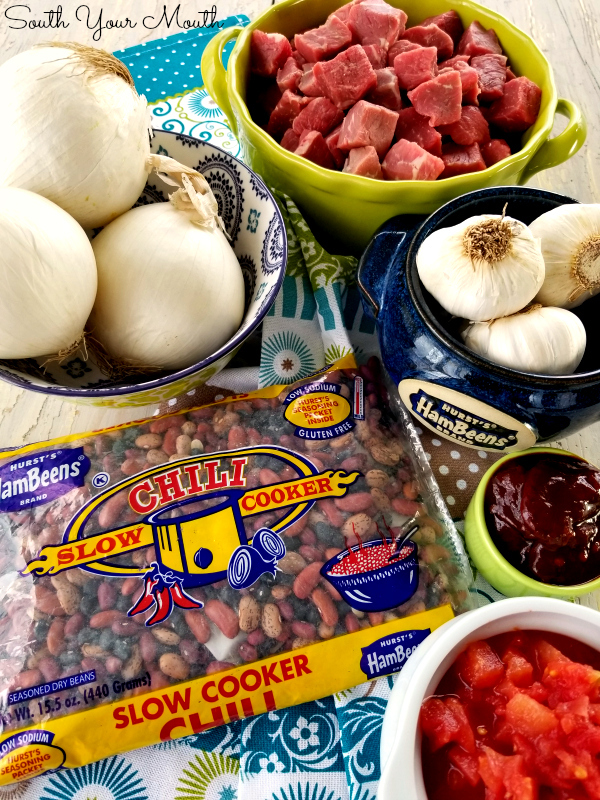 If you like more tomato flavor in your chili, consider adding 2-3 tablespoons tomato paste.If you can’t find Hurst's Slow Cooker Chili Beans in your market, please ask your grocer for them. Until then, you can also substitute 2 cups Hurst's Dried Pinto Beans plus 1 packet chili seasoning mix. Such a funny, but messy, story! Mario drives a car here too, and my slamming on the brakes from the passenger side doesn’t help. I love chipotles, so I will be trying your recipe. Thanks! Those dang passenger brakes never work for me either! I'd love to try this. Any thoughts on how to adapt this to an Instant Pot? Unfortunately, what I know about Instant Pots you could fit in a thimble. I'd maybe look for another IP chili recipe using dried beans then go from there! If you manage to adapt it, I'd love for you to share your results with us! Good luck! 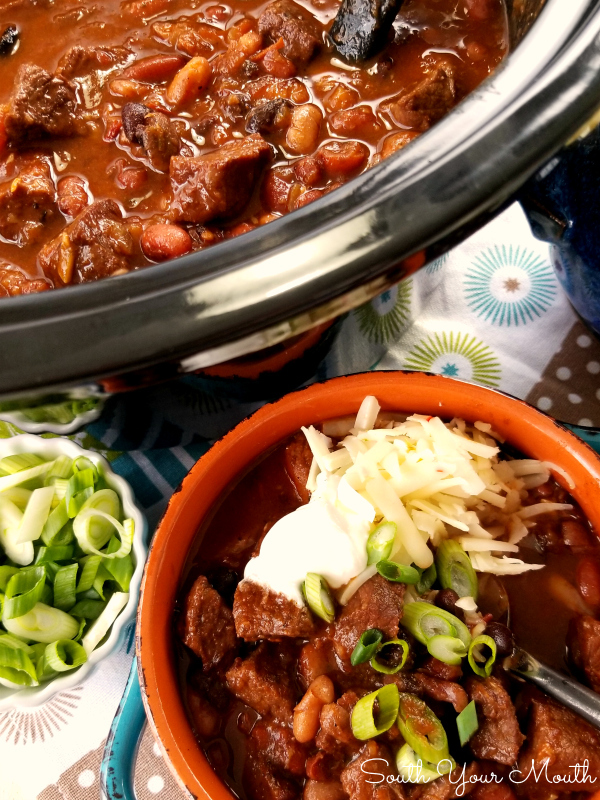 I don’t know why I never think of using the slow cooker for chili–this may just be what’s for dinner tomorrow night! Am I supposed to add the seasoning packet? Yes, you add it back when you add the remaining ingredients. I thought that was clear when I wrote to set it aside to add later then wrote to add remaining ingredients but I bet you're not the first person to wonder about that! I'll add a line about the seasoning packet specifically. Thanks for asking! You're not being clever by disabling the right click function so we can save the recipe. We just have to take a screen shot and save it to a word doc. All you did was make extra time for me, which I don't appreciate. This will be my first and last visit to your site.